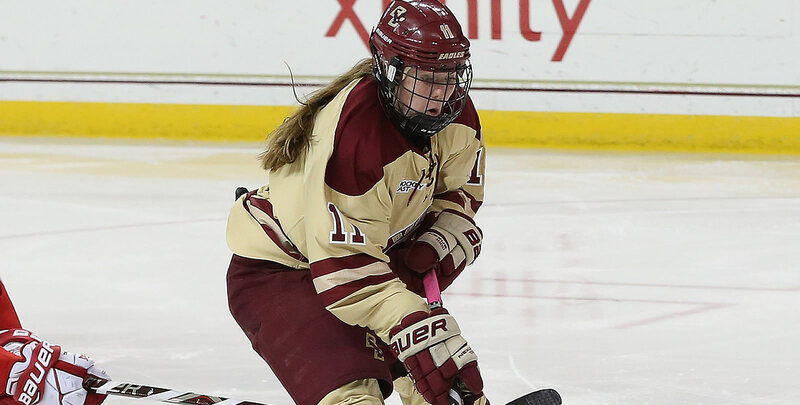 BURLINGTON, Vt. - The 10th-ranked Boston College Eagles (16-9-0, 13-7-0 WHEA) netted three goals in the third period to pull away from the Vermont Catamounts (7-14-4, 5-11-2 WHEA) Saturday afternoon at Gutterson Fieldhouse. "We played hard today and gave ourselves a chance," said head coach Jim Plumer. "Credit to BC for raising their game when they needed to. I'm proud of our effort this weekend." - Melissa Black (24 saves) was the story in the first period, stopping all 12 shots she faced in the opening 20 minutes. The UVM netminder made several key saves to keep the game scoreless, most notably with 39 seconds left in the period when she slid across the crease to rob Makenna Newkirk waiting for a backdoor one-timer. - Backed by the momentum of Black in goal, the Catamounts took the lead when Kristina Shanahan opened the scoring on the power play. Anna Erickson dished a pass to Shanahan on the half-wall where the sophomore forward neared the goal and snapped a shot that beat Maddy McArthur (20 saves) below the glove. Saana Valkama was credited with the secondary assist at 5:51 in the second period. - BC responded with two goals in 6:35 to take a 2-1 lead into the second intermission. Megan Keller tied the game after a give-and-go pass with Caitrin Lonergan who went on to score on a breakaway for the go-ahead goal shortly after. - Jillian Fey and Lonergan scored two goals in the first 4:11 of the third period to quickly go up by three. Fey's second goal of the weekend came on a slap shot that ricocheted off a Vermont defender and into the back of the net, which proved to be the difference maker. - UVM rookie Maude Poulin-Labelle cut the deficit to two goals when she scored her fourth marker of the season. The Québec native fired a shot that was blocked by a BC defender, but grabbed the rebound and whistled it past McArthur with 7:03 left in regulation. Sini Karjalainen and Val Caldwell assisted on the goal. - Erin Connolly eliminated any hopes of a Vermont comeback when she buried an empty-net goal with 1:15 remaining. The Catamounts return to action Friday (Jan. 25) when they travel to Boston to face the No. 3 Northeastern Huskies at Matthews Arena. The opening game of the weekend series is scheduled for a 6 p.m. puck drop, and will be broadcasted live on NESNplus.